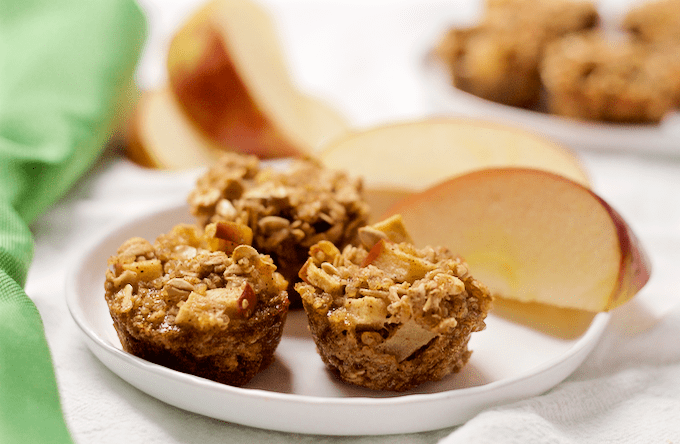 Wholesome mini muffins with quinoa, oats and apples! Great finger food for little ones and a lovely, portable, pop-able treat for older kids and adults! I’ve got a fun breakfast treat for you today! We eat a lot of oats around here, especially for breakfast (overnight oatmeal jars are a weekly staple), so I like to try and branch out to other grains from time to time. 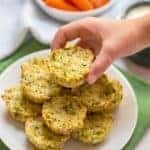 These quinoa bites are perfect! Okay, yes, they also have oats, so I’m not straying too far I realize. But it’s a great way to get a different grain in at breakfast time. And yes, quinoa is technically not a grain. It’s a seed. Details, details, details. These little mini muffins are soft and full of apple and cinnamon flavor with a perfect amount of sweetness from the maple syrup. Quinoa is protein packed, and you’ve got the oats and fruit, so these really are a pretty well-rounded little meal or snack all on their own. I make a big batch, we eat a bunch the next day (they’re great both warmed up and cold from the fridge) and I freeze the rest to pull out for another morning. Super simple! 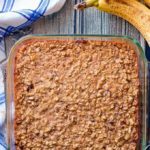 My kids eat these for breakfast or morning snack and I like that I can grab a couple to go if I’m on the run. They’d even be great to send for school lunches. 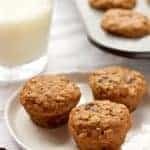 I’ve adapted these mini muffins from this recipe and replaced the sugars with maple syrup so that they’re naturally sweetened. They’re also gluten-free (make sure you use certified gluten-free oats) and you could sub a couple of flax eggs for the eggs if you want to make them vegan. 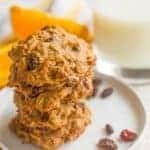 Make your mornings a little easier and healthier this year with these little quinoa breakfast bites. Enjoy! 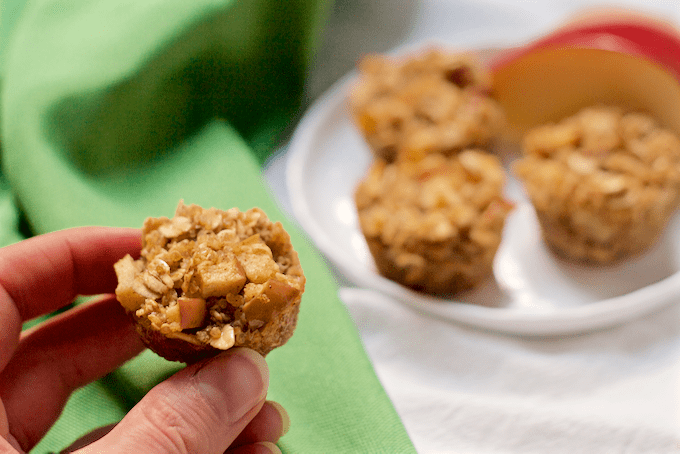 Wholesome mini muffins with quinoa, oats and apples, naturally sweetened with maple syrup. Preheat the oven to 350. Spray a mini-muffin tin with cooking spray. Mix quinoa, oats, cinnamon and salt together in a large bowl. Separately, beat the eggs in a small bowl. Stir in maple syrup. Add the egg mixture to the quinoa mixture and stir to combine. Fold in the apple pieces. Fill each mini-muffin cup all the way full. Use your spoon to pack each one down a little bit. Store the mini muffins in an airtight container in the fridge. Or freeze the extras in a freezer bag for up to 3 months. Can’t beat that apple + cinnamon combo, right?! Hope you love these little muffins! Do you have the nutrition info. on these muffins? Hi Amy! I currently don’t include nutrition information for my recipes, but you could plug this into an online nutrition calculator, like this one: http://www.myfitnesspal.com/recipe/calculator. Hope that helps! Haha, right Lisa! I’m like you in that I pick up tid-bits here and there from cooking and from my job as a health and nutrition editor. Some of it sticks and some of it doesn’t… 😉 And a big YES to easy, fast, healthy breakfast options for those early mornings when everyone’s hungry and everyone’s busy! I hope you love these! 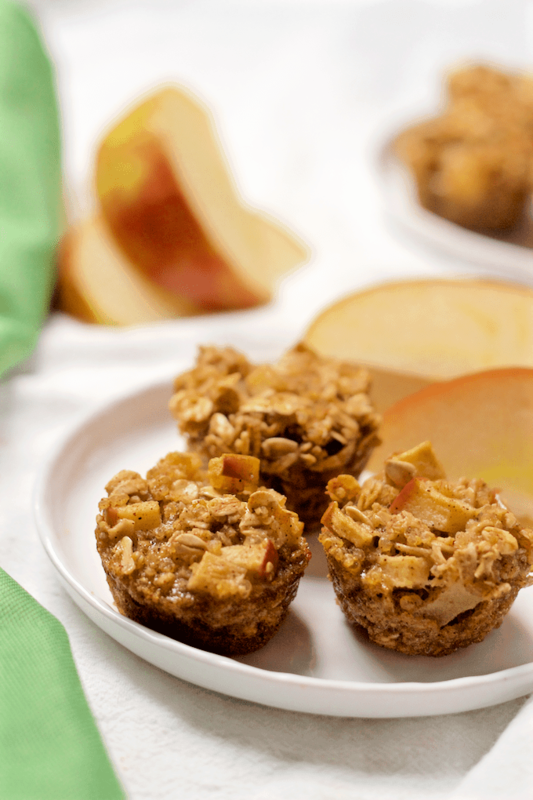 These apple cinnamon breakfast muffins look fabulous and so nutritious! 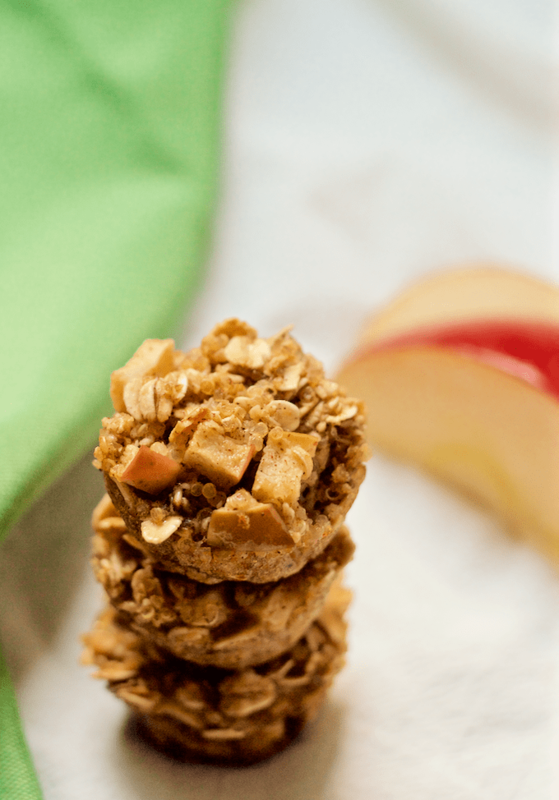 I adore anything with apple and cinnamon, so these must make an appearance in my kitchen soon! Thanks Rachel! It’s such a delicious combo, right? I hope you give these a try and enjoy them! Oh these look fabulous, I’d love to start my day with a couple! At least 2… probably 3. Maybe 4… Have a great weekend, Lauren! I’ve been wanting to add more quinoa to my repetoire, so I can’t wait to try these out! 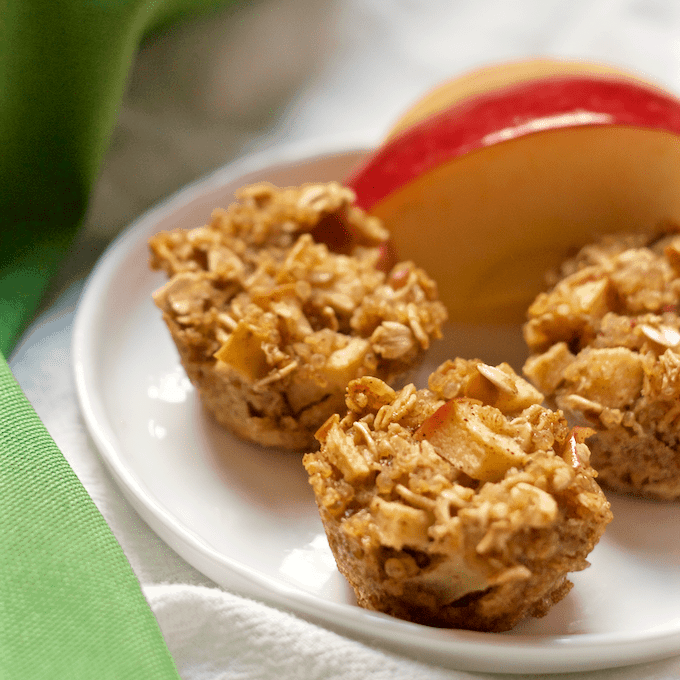 I love apple cinnamon and just know my little guy would love these for breakfast or a snack! I’m with you – always looking for new ways to incorporate quinoa 🙂 Hope you both love these mini muffins! I LOVE this muffin idea! Thanks for linking up with What’s Cookin’ Wednesday! This is going on my must make list!! 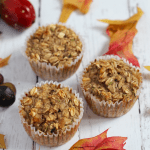 I love these healthy muffins! In what liquid do you cook the quinoa to have it ready to go in these muffins? In water? Hi Kristy! Yes, I use water to cook the quinoa. Hope you give these a try! I made these muffins yesterday and was quite disappointed with how they turned out. They are super crumbly and very plain. Smell really good though! Hi Elise – I’m sorry to hear they didn’t work for you! I’ve made these multiple times and they’ve never been crumbly for me. I do let them cool first so they set up; I wonder if that was the problem. Also, yes, they are not super sweet since they’re meant to be a healthier breakfast muffin. But you could certainly add some more maple syrup or serve them with a spread of fruit jam if you’d like! Would it work to make these as a full size muffin? 8 don’t have a mini muffin pan. Hi Diane! Sure, I think that would work. You’ll just need to bake them for a bit longer. I’d suggest checking them around 22-25 minutes and seeing if they seem done. I just made these and they are so “neat”!! I was going to do the regular size muffin pan, but I’m glad I did the mini, they are perfect bites! Ive already ate like 6 of them! I used honey, they are not sweet, they are just yummy and I can’t wait to have some with some good greek yogurt! Thanks! I’m so, so happy to hear that Shannon! Thanks so much for sharing! These were sooooo good!!! What a great combo! I’m so glad I found your site and this recipe. Thank you for sharing. So easy and delicious! Very versatile….. I’m memorizing this!! Keep up the good work! Hey- these look great. 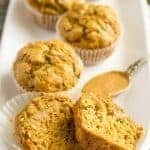 I am allergic to oats, have you ever made a quinoa muffin without grains or any ideas for a substitute? Hi Amy! We are oats-crazy in my house so I’ve never looked for a substitution. However, I just did a bit of poking around and some people have suggested using ground flax, rice bran, quinoa flakes or chia seeds in place of oats when baking. I haven’t tried it myself but hopefully that gives you some options to try! Loved these little bites! Really good with a small smear of homemade apple butter…. Would these work with flax eggs? Hi Stephanie! I haven’t made this recipe with flax eggs, but I think it should work fine. Would love to hear if you try it!